Three things instantly identify any car from South Korea: the indicator switch will be on the right; it will have a horribly fiddly DIN fit radio; and the plastic inside will stink of fish glue. 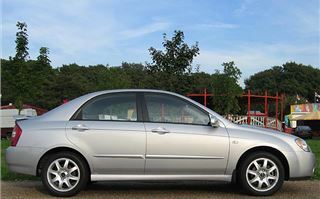 However, the 2004 KIA Cerato is a neat, distinctive car that looks good from any angle rather than the conflicting mish-mash or all pervading blandness that can sometime emerge from Korea. Its style won’t simply disappear into the forgettable like so many of its and Hyundai’s forbears. 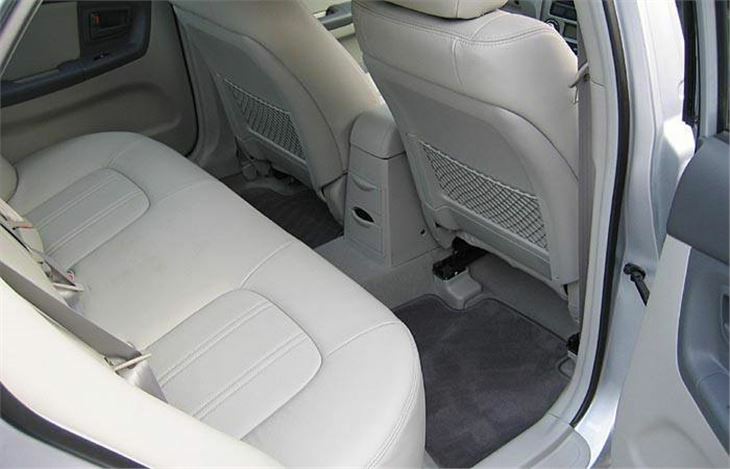 And, in the £11,999 2.0SE saloon you get a lot of kit, including a/c and leather. First impression is the smell. Why does the inside of every South Korean have to be such a nightmare to the nose? 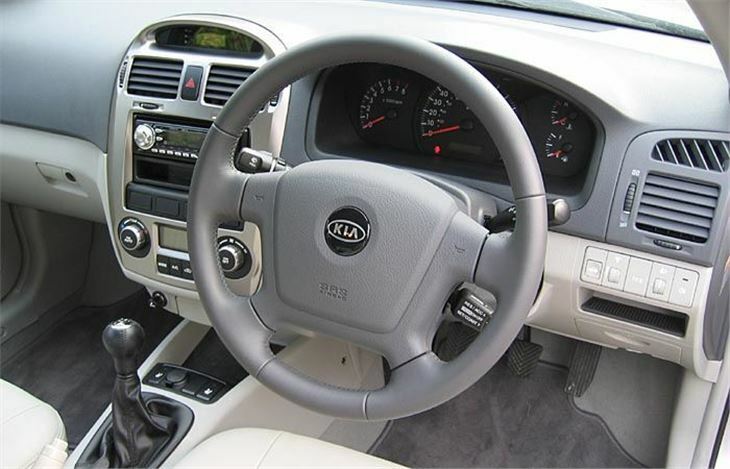 Get used to that and, looking around, you find nice, big dials (the speedo is enormous), lots of stowage space including cupholders, trays and a split-level armrest. Three proper three point belts across the back seat. 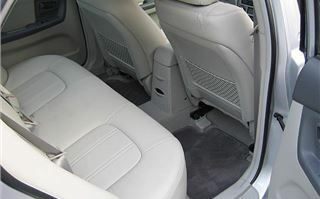 60/40 folding back seats. 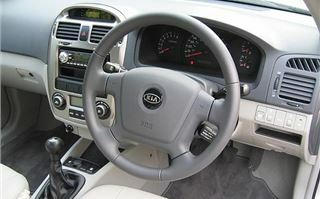 Height-adjustable steering wheel and driver’s seat, but no lumbar adjustment. Get going and apart from the indicators being on the right it’s a painless experience. At least the steering has a bit of meat to it. Switch on the radio. Er, how do you switch on the radio? None of the obvious big knobs do the job. So you have to stop and pull out the half-inch thick radio instruction manual to learn that the little curved button at the top left corner is the on/off switch, which must be pressed to switch on or pressed and held for more than a second to switch off. And if you want to insert a CD you have to fold down the front. And in press cars there’s usually a note requesting you to remove the front when you park, but you haven’t got anywhere to put it so you don’t. Why do the South Koreans and persist with irritating ICE? Why can’t they build it in? If Toyota can even for its Thai market cars, why can’t KIA? On the motorway it thrums along very well. At motorway cruising speeds you sit on a very pleasing part of the power curve that gives enough acceleration without strain or excess noise. It’s a very good cruiser. Not much wind noise either. All you hear are the tyres. Gearing worked out at about 23.5 mph per 1,000 rpm, about the same as a Ford Focus 1.6. Back road handling is fine. No brilliant, but not bad either. Nothing to criticise there. The steering still feels meaty enough too. Ceratos come in two body styles: the good looking saloon and the less good looking hatchback. 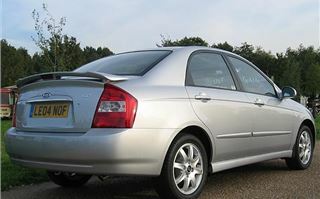 The hatch is the poorer relation, starting at £9,750, the same as a run-out model Ford Focus Flight with CD and a/c. Saloons kick off at £10,500 for the 1.6LX and end abruptly at the £11,995 141bhp 2.0SE. So there’s only £2,245 between the cheapest and the most expensive. Obviously at £11,995, the 2.0SE sells on value. 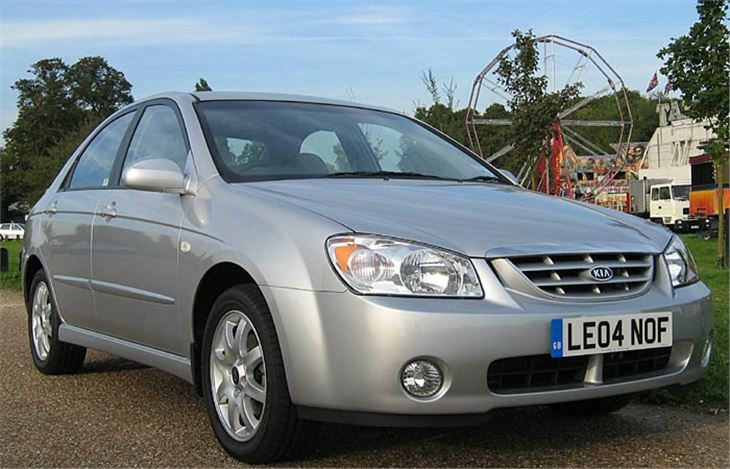 Its basic list price is the same as a heavily discounted 2.0 litre Mondeo or Vectra. And that’s where buyers should hit decision time. But they won’t. They’ll be impressed by the Cerato’s looks, equipment, performance and showroom value for money. They’ll like its neat dimensions that will fit their garages. 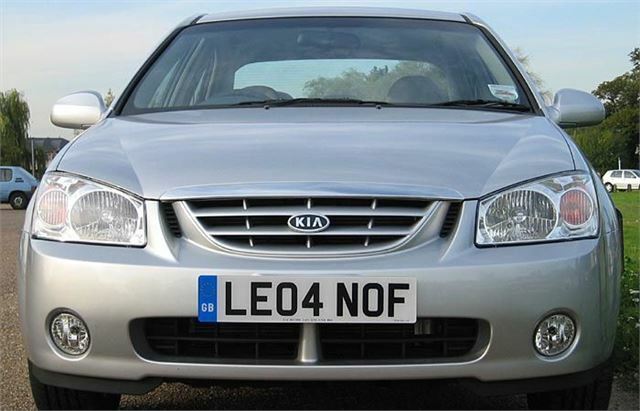 They’ll love the luxury of leather seats in a car for less than £12,000. And they’ll buy it in droves.